A small but tidy hut in a frosty clearing behind Mount Thomas. Since the hut is small, near Christchurch and easily accessible, it fills up quickly. There is some space for camping around the hut. Water is available from the stream outside. 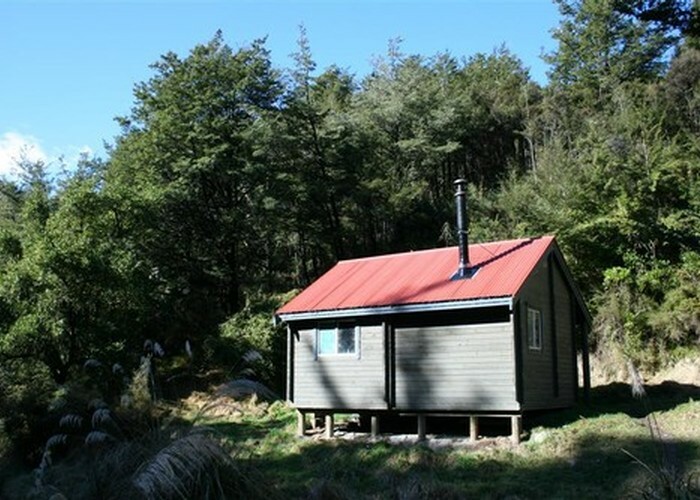 Pinchgut Hut • By Matthew. Via track above Okuku River, or from Mount Thomas on a poled track. DoC site says sleeps 9 but only 7 mattresses there. From Rangiora take the road through Loburn and strait through onto White Rock road. The road turns into a gravel road through farm land, over a couple of fords until a small carkpark can be seen on the right hand side. Park here. The road drops down to another ford. The start of the track can be seen across the river. Added 21 February 2006 by MatthewMatthew. 5 revisions, most recently 22 March 2016 by glennjglennj.